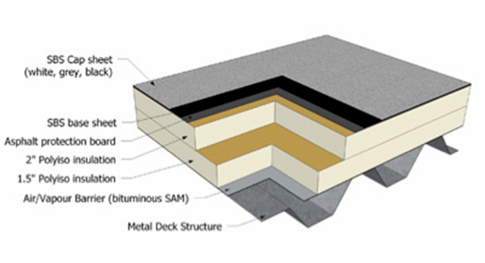 Modified Bitumen roof system is a two-ply application waterproofing system. It contains a base sheet with no granule and a cap sheet with granule protection. These reinforced rolled sheets can be adhered by; using hot asphalt, fused by torching the sheets together or cold applied using adhesives or peel & stick.